Looking for a walkway design and installation contractor? EcoScaping is a full service walkway and patio installation company, specializing in concrete paver patios and walkways as well as natural stone. Our designers on staff are some of the most creative people in the industry. They will come to your home and develop a plan that fully incorporates your desires and ideas for your front walk or back patio. Our designers are fully knowledgeable of the current trends in outdoor living and the most current materials used. Our production team will work with you through completion of your project, addressing any concerns you may have during implementation. We provide excellent quality, and will deliver your project in a very timely manner. 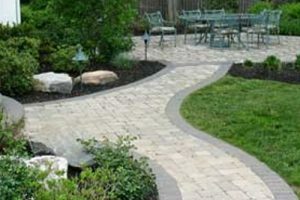 If you’re looking to enhance your yard with a custom designed walkway with pavers or natural stone, contact Ecoscaping today for a FREE consultation.